I receive a lot of questions not only regarding which tools and services I use to run my trading but also my websites. So I decided to put them all together here for easy access. This isn’t intended as an exhaustive list, but every service listed here is one I use or have used and that I recommend based on that first-hand experience. 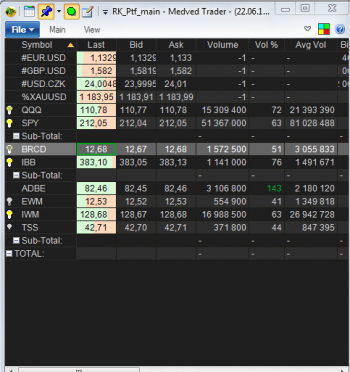 I use several strategies to trade and to pick the right stocks to trade. These videos describe them. This is a broker I’ve used for many years. This company offers many instruments to trade on my exchanges around the world. I use it to trade stocks, ETFs, currencies (Forex), commodities, and CFDs. It’s possible to trade using your desktop or a mobile app. I use Amibroker every day. It’s my main program for chart analysis. I analyze many different products there, from stocks to commodities or currencies. It’s highly customizable and very easy to use and quite cheap. It has very good screening features I like to use. It’s one of the best trade management programs I know. I use it for managing my trades during a trading day. It’s a product that has the best support from its creator. And if you ever heard of Quotetracker software, then note that this is the successor to QuoteTracker. Check MedvedTrader here. I searched a lot for a good program to maintain a diary of my trades. I tried to use Excel, then also some online services, but finally I found TradingDiaryPro. 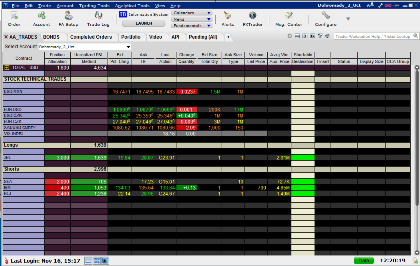 This program runs on my PC and not only keeps the list of all my trades, but it also generates many reports I use to evaluate my performance. I use its reports also to show results to my clients. I use this ultrabook when I’m on the move. It’s a powerful ultrabook that’s also very lightweight. The screen size is fine, and I can do almost everything I do typically on my HomeOffice workstation. When I’m outside of my trading office, I use this additional security tool to make my connection and online trading safe. This is a very good website for traders and investors. It offers a very useful stock screener feature. But the additional functionality is good, too. I recently decided to change my Web hosting company. I finally selected LiquidWeb, and I have to say that it’s the best choice I could make. The company is topnotch; its support is superior. I run a VPS server there for hosting my sites, but they have also plans for shared Web hosting. If you need good and reliable web hosting, consider Liquidweb. I used the SiteBuildIt platform when I created this site. If you want to build a website that eventually has to make money, try SBI. This is one of cloud drives I use for my needs. I can access files from desktops but also from my tablet or even smartphone. Zapier is really a time-saver for me. It allows to automate many tasks by connecting two online services together. It syncs my Google calendar with ToDoist. It sends tweet automatically when I publish something on my membership site. The beautiful part is that you don’t need to be a programmer, and you can create connections (Zaps) very easily. Evernote is my additional memory. I put all my notes there. They’re stored in the cloud, and I can access them from any device. It has desktop apps and app for tablets and smarphones. Very useful. This is a solution I use to send you regular newsletters and be in touch with you using e-mail. It’s a good service also for autoresponders and email courses. Th is is the shopping cart I use to sell my eBooks. It’s compatible with PayPal Standard, Paypal Pro, Google Checkout, Authorize.net, TrialPay, Clickbank & 2CheckOut. It works like a charm with a very low flat price. It comes with a decent affiliate program for your products.